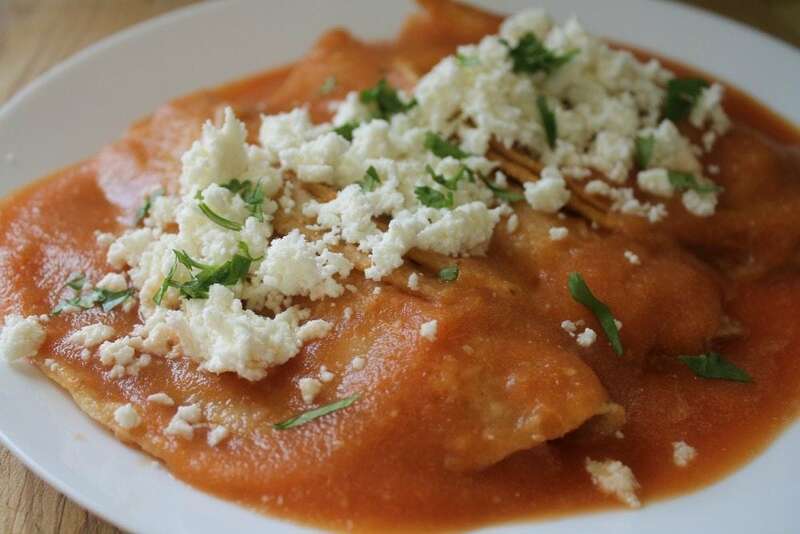 Entomatadas is an easy-to-make and tasty Mexican recipe. It consists of fried tortillas dipped in red salsa. Top with Queso Fresco and chopped cilantro. Delicious! My mom used to make us Entomatadas de Queso at least once a week. We were not big meat eaters growing up, but we were and are HUGE cheese lovers. This is when being cheesy is a good thing. It is a super easy recipe and very adaptable. Please know that this entomatadas recipe is very basic. Change it up and make it your own. The hubs and my son are typical guys. They like beef and rare. Me? I would prefer a bowl of frijoles de la olla before something killed any day of the week. That is why this dish fits our family perfectly! I will fill mine with cheese, and for my family, I make chicken entomatadas. I am kinda making two dishes, but really it is just one … and there is no blood on the streets. Lol. It starts with a basic Mexican red salsa. My mom is probably making salsa right this very minute. So, please don’t tell her what I’m about to say. You can use store-bought salsa like this one to make Entomatadas. Shhhh! If that is the route you take, I highly recommend blending your store-bought salsa. Sometimes, they are chunky style or too watery. It will not really stick to your tortilla. 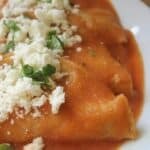 Can you make Entomatadas with Green Salsa? Yes! 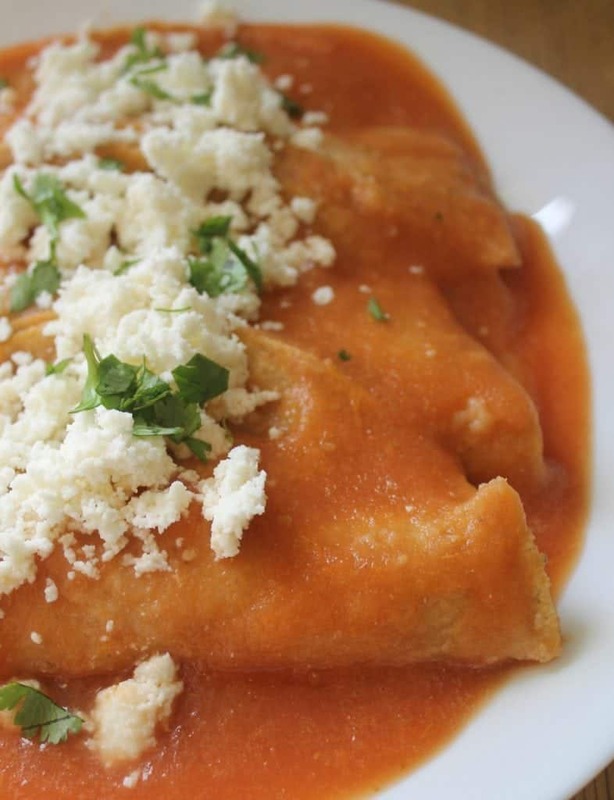 This entomatada recipe is with red tomatoes, but tomatillos are green tomatoes. Instead of using a red salsa, you can use green salsa verde, and your Entomatadas Verdes will be just as delicious. You can even do half red tomato entomatadas and half green salsa verde entomatadas. It’s the best of both worlds! You are not going to need a lot of oil. We are not doing mega frying here. 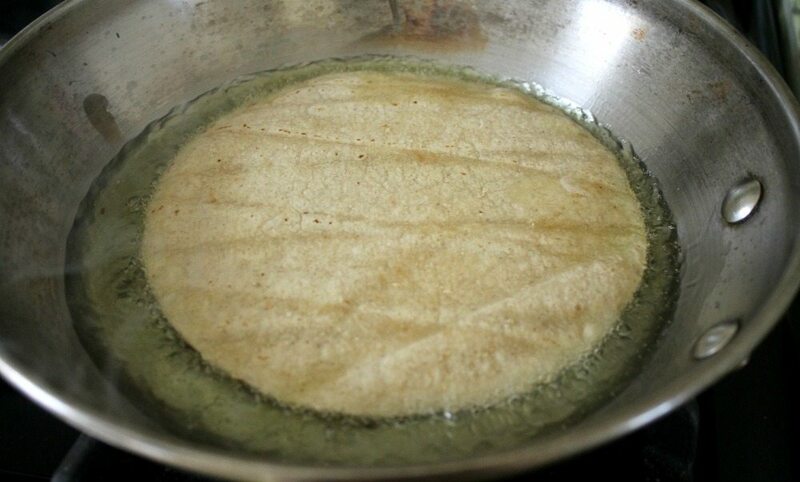 Fry each corn tortilla lightly, about 1 minute on each side. This dish will come together in a snap. It truly is perfect for busy weeknights. 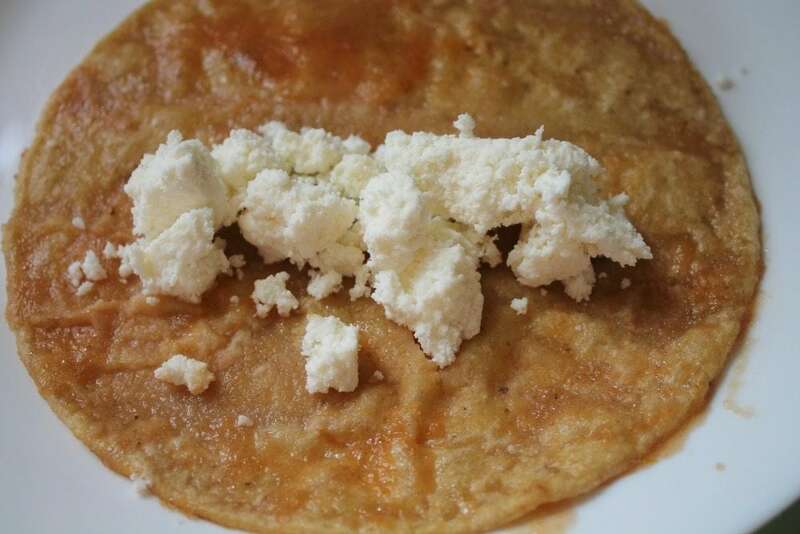 I have never had Entomatadas with flour tortillas, but I think that depends on what part of Mexico you are from. If you do this, just know that you flour tortillas will get floppy when they are dipped in the tomato sauce. I suggest frying the flour tortillas, stuffing them, rolling them up like an enchiladas, and pouring the sauce on top. Also, you can do this in a casserole dish, and you can serve later. Winner Dinner! 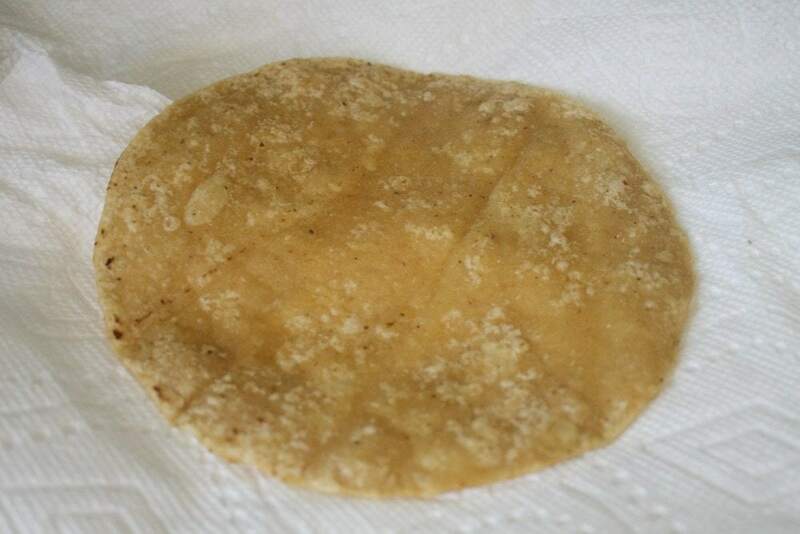 Place the fried corn tortilla on a paper towel to drain any excess fat. Some oils are better for frying because their high smoke points. Since we are not “frying,” you can use healthier oils like coconut oil, sunflower oil, grapeseed oils, avocado oil. Using your tongs, carefully dip the fried corn tortilla into the tomato salsa. You will need to work quickly. So, have everything ready for assembling. Call the family to dinner. It will be served soon. 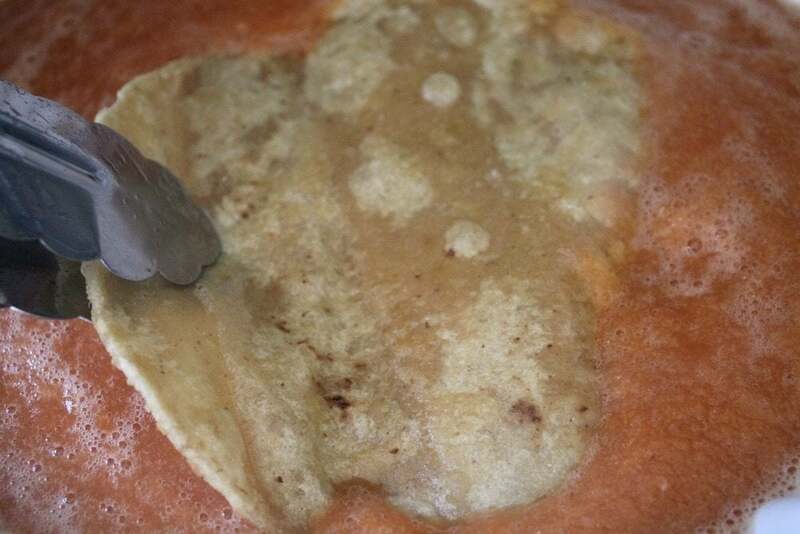 Lay the tortilla in a casserole dish or serving plate and add your filling. These are Entomatadas de Queso, or Cheese Entomatadas. I am using Queso Fresco. Fold the other side in. Repeat with each tortilla until done. Cover with foil paper to keep them warm. Queso Oaxaca and Queso Monterey will not have enough time to melt and not ideal for stuffing. The other thing you can do is make the entomatadas..
Top with one of the melting cheeses. Then place under the broiler for 1-2 minutes to melt the cheese. That will also keep them warmer longer. To serve your Entomatadas, top with more Queso Fresco and chopped cilantro. Add more sauce to the plate and serve immediately. If you do not serve it immediately, it will get cold. Be sure to cover with foil paper and place them in a warm oven until your family is sitting at the table. You can also add thin slices of red onion. Man, I am hungry now. lol! I should make Entomatadas. 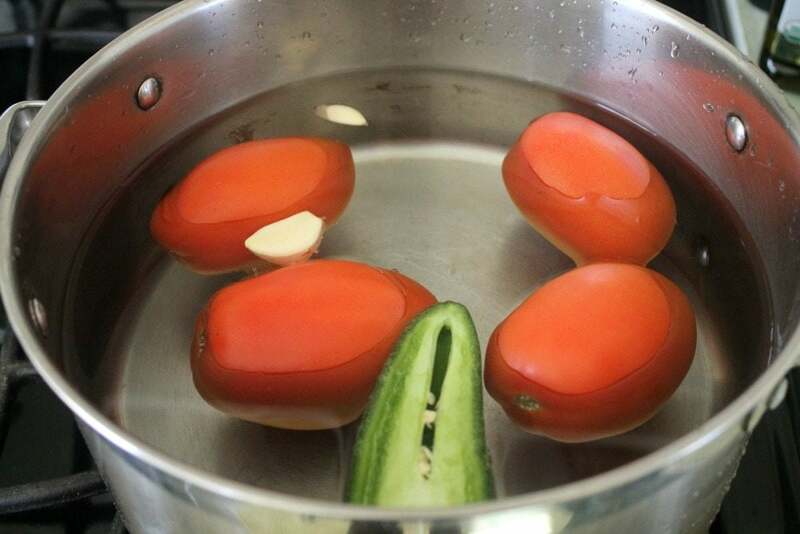 In a stock pot, add tomatoes, jalapeno, onion, garlic, and water. Carefully discard the hot water. 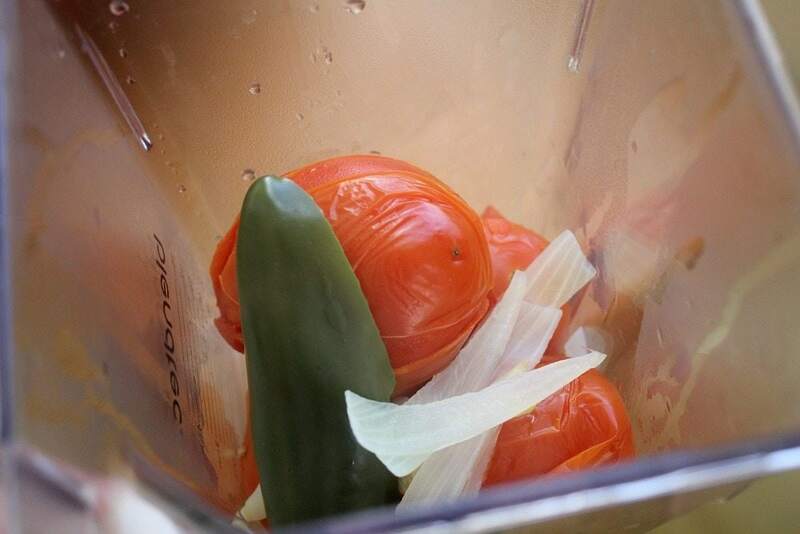 Add everything to a blender and salt. Lay the tortilla on the serving plate and fill with cheese. Top with lettuce, tomato, etc. This Mexican recipe looks outstanding, I love Mexican cuisine and would love to try this sometime. Oh wow this sounds so good!!! I’m all for meatless recipes like this! Perfect to customize if you want to add chicken or meat! Love Queso Fresco and this sounds perfect with the cheese inside and on top. Your Entomatadas look incredible. Definitely adding this to my menu. I grew up eating this recipe. My mom made the best. My children love entomatadas with chicken too. Thanks for sharing this recipe, because I always thought growing up, that my mom made this recipe up. No of my friends heard of Entomatadas. This was our comfort food when we were growing up. My mom made them with homemade flour tortillas instead of corn and filled them with potato & cheese. OMG! They were even better the next day!! I’ve never made them with corn tortillas or chicken but this recipe sounds really delicious. I’m going to try it. Thank you for sharing this recipe. If you’ve never had Entomatadas, I encourage you to try them. You’ll love them. What a great, simple recipe! I’ve made this a few times and my family loves it! We have a vegetarian in the family and this makes it super easy to accomplish her and us meat eaters too! Thank you for sharing! Right! That’s exactly why I love making entomatadas. Everyone is happy! Definitely a keeper. Thank you will be making this again. Definitely a keeper I enjoyed it and will be making it again.